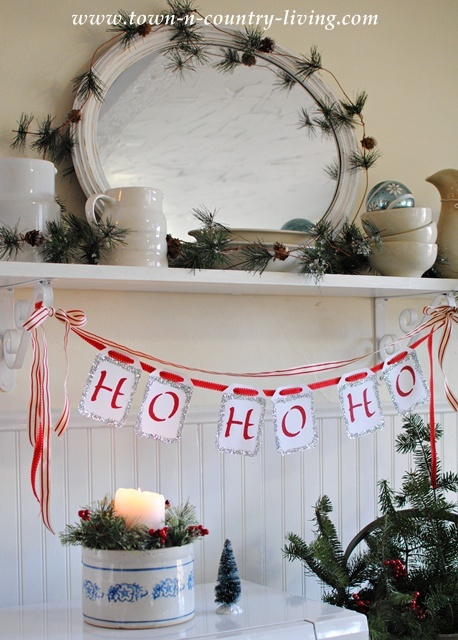 Create a Quick and Easy Christmas Banner! Can you believe there are just two-and-a-half weeks until Christmas? Yikes! I haven’t even started my shopping yet because I’ve been busy decking the halls! This week I’m excited to be joining 24 other bloggers for “Creating a Handmade Christmas” which started a couple days ago. You can see the full schedule at the end of this post and visit all the inspirational handmade holiday ideas! 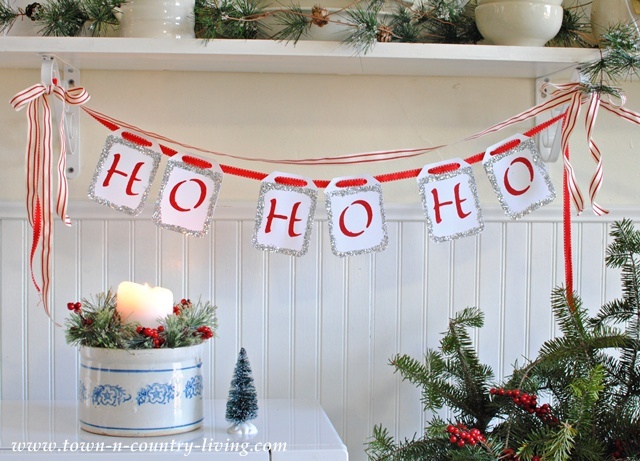 Today I have a quick and easy Christmas banner tutorial to share with you. Make this on your own, or get your children involved! You can choose any holiday saying for your Christmas banner. 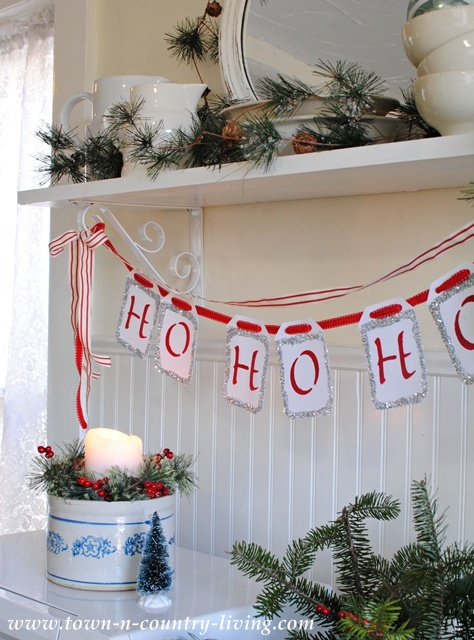 I decided upon “Ho Ho Ho” because it’s whimsical and I needed a short banner for this space in my kitchen. I used plain large tags, red acrylic paint, glitter, and red ribbon. Not pictured is the glue, brush and stencil. 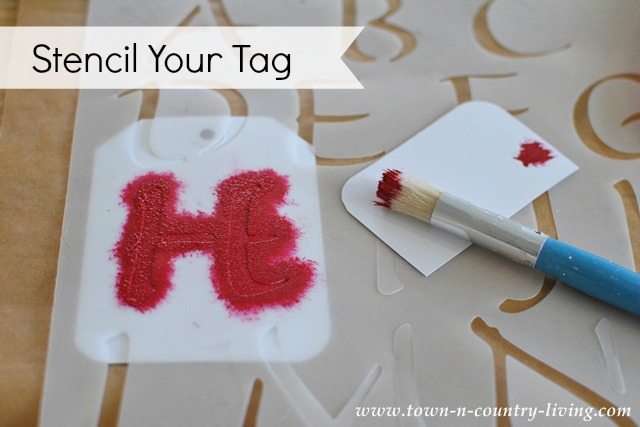 Place the stencil atop your tag, making sure that edges are even. 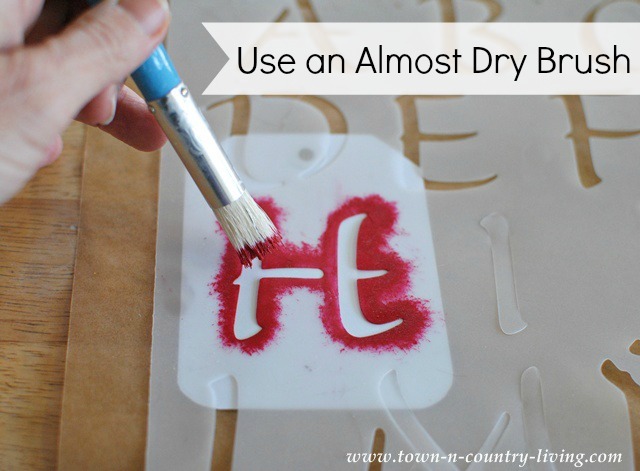 Using a stencil or stiff artist’s brush, apply just a slight amount of paint. Your brush should be almost dry. Too much paint on your brush and some of the paint could ooze underneath the stencil onto the tag. 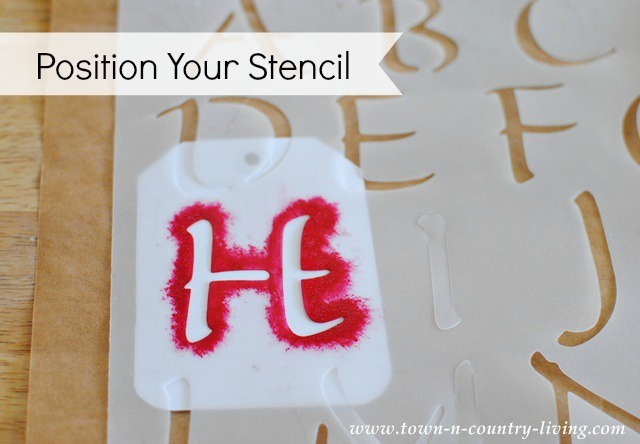 Using a pouncing motion with the brush, gently fill the stenciled space being careful not to move the stencil. Very carefully lift the stencil template from the tag. 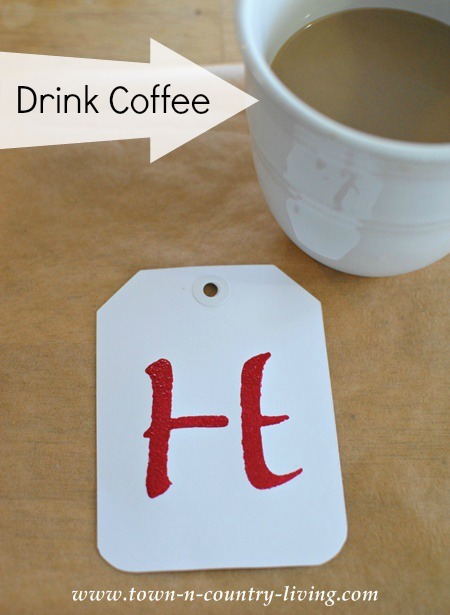 Enjoy a cup of coffee while you wait for the paint to dry, which doesn’t take long. 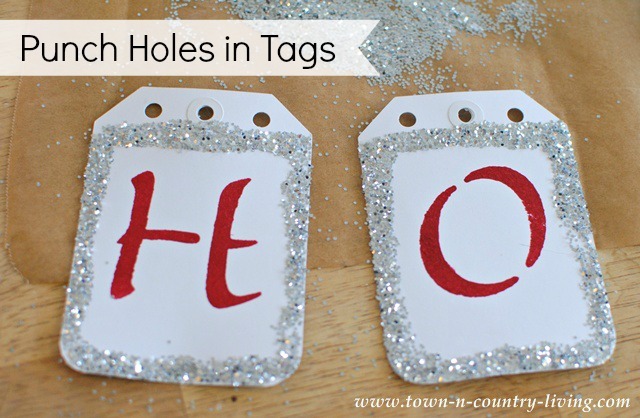 Paint a border of glue around the letters (I used Mod Podge) and add glitter. Shake off excess. My tags already had a hole in them, but I punched 2 more so I could thread the ribbon through. 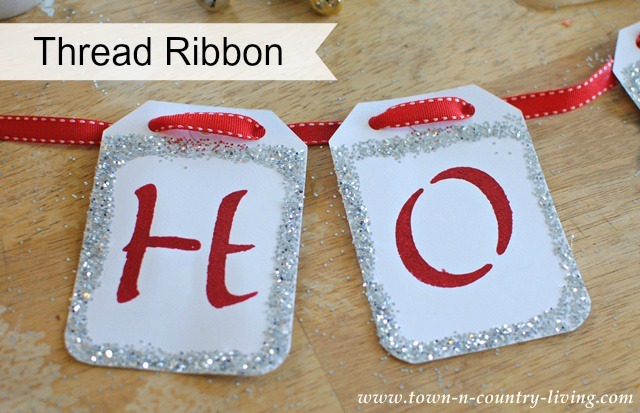 You could easily use a hot glue gun to apply the ribbon, but by threading your ribbon through the holes, it allows you to slide the letters along the ribbon. This way, you can space the letters to your liking. All that’s left to do is hang your banner! Be sure your ribbon is long enough to tie the ends for hanging! If you like this project, be sure to check out my instructions for creating a pine cone garland!! 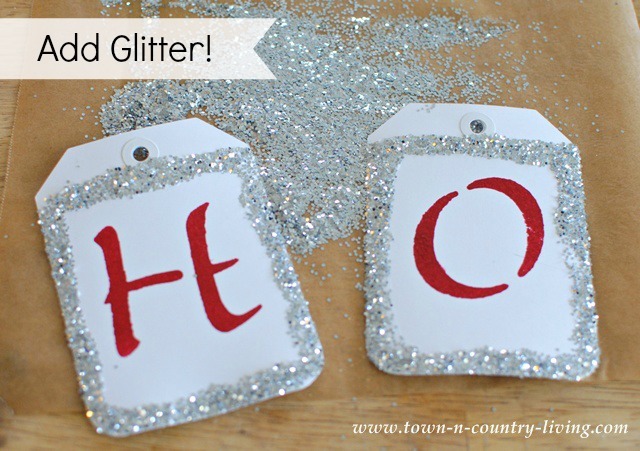 I hope you’ll visit the other bloggers participating in Creating a Handmade Christmas! A friend of mine gave me a box of tags. I’ve used them for various things but never thought of this. And I just might have time to make this easy project! 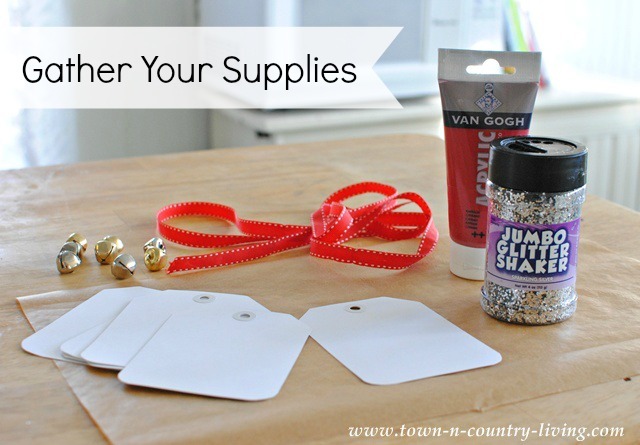 Great idea especially cuz I have the stuff on hand. So simple and sweet … I especially loved the drinking coffee part in your tutorial. 🙂 Your home looks so bright and cheerful! Love it all!!! I love your home. It’s so peaceful and NEAT and I love all your special little touches. Jennifer, this is sweet and festive.I have yet to make a banner….maybe new years. Thanks for the details. Love your banner Jennifer! So festive and fun! Love your banner Jennifer. I adds so much to your room and it’s so festive with the glitter. Kudos on a job well done. Thanks for joining us on the tour!! Pretty and easy, Jennifer! Love it! No, I can’t believe it is just 2 1/2 weeks away. While I’m done decorating, I still feel like I have too many gifts to get and get them sent out on time. Super cute banner – love the glittered edges! Don’t remind me that Christmas is coming in 2 1/2 weeks – I’m so not ready!!! I love your beautiful banner. So simple yet so cute!! I love it!! Especially with peppermint stripe ribbon!! Thanks for sharing! Great tutorial, so cute!! So happy to be on the tour with you! Jennifer, this is so awesome! I really need to start making banners! Love the glitter and the red you did a beautiful job! I love your festive banner! 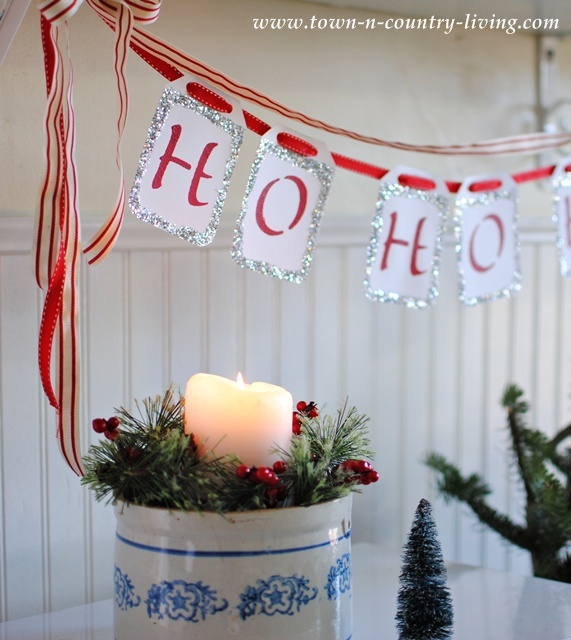 Jennifer love…love…love this garland.It is so simple and so pretty! I love this banner but even more I adore the ribbon! So festive and pretty. I’ve enjoyed being on the tour with you! so clever!! love your ideas!! just discovered your site today.